Villa Aurora "Our Belize Vacation" - "Our Belize Vacation"
A 300' private dock has a palapa for shade from sun, and benches to rest on after a day of fishing, or just to appreciate the tranquility of the setting. There also is a full length hammock in which you may take an afternoon nap, or where you can admire the sparkle of millions of stars in the sky, a truly unique sight. 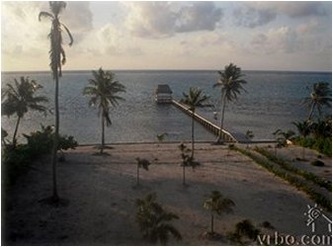 If you would like to swim or snorkel from the dock, there are stairs for easy access in and out of the shallow waters. The dock is easily accessible by water taxis, dive boats, and fishing captains who will make your stay a breeze. 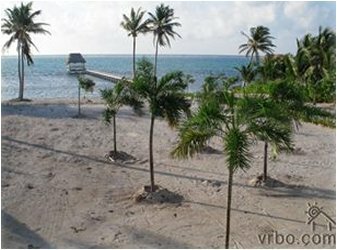 Fishing, scuba diving, snorkeling, or an afternoon in town is only a call away. Behind the house, the lagoon with a short dock is situated, with a short dock can be found. 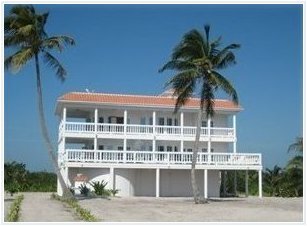 For the avid fisherman, catches are obtainable off both docks. 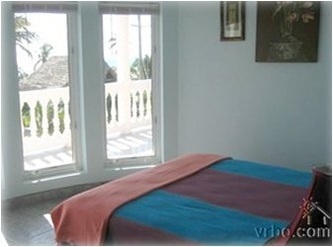 Inside the grand villa there are four bedrooms and three bathrooms, as well as a sofa bed for extra sleeping space. 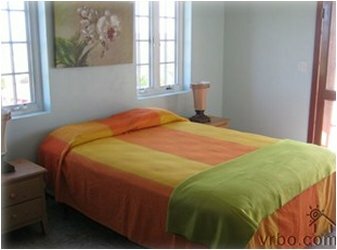 There is one spacious bedroom and private bath on the second floor The third floor has thee bedrooms, two of which have their own en suite bathroom. Two of the third floor bedrooms have doors leading onto the veranda, allowing the sun to flood them throughout the day. The bathrooms are connected to two of the third story rooms. The master second-floor bathroom has a bathtub, as well as a large separate shower, which is unique due to its non-existent ceiling. You will enjoy showering in the warm, fresh air of the tropics--an extraordinary and romantic sensation. 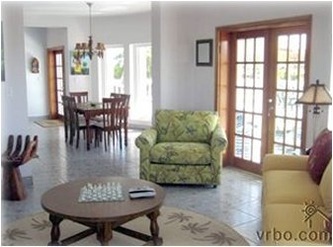 The cozy living room has a television with more than 500 satellite channels. 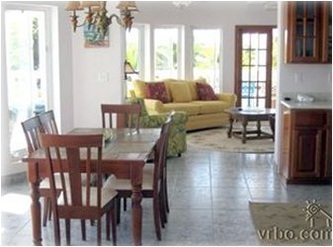 There is an enormous kitchen with all of the essentials) that extends to the dining room. Lastly, the villa has a fully esuipped laundry room. There are countless places to visit, and individuals to help you enjoy a relaxing and fun vacation. 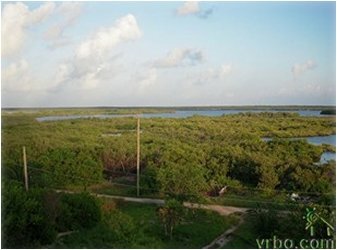 If you want, a local fishing captain will show you various spots in over 2,000' of water that are less than 5 minutes away from the dock, or other places past the reef that are teeming with fish that can be cooked back at the house. 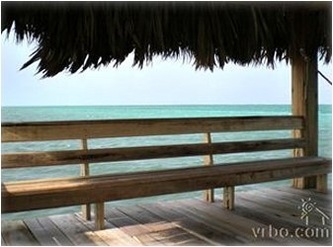 Snapper are available at the front dock, and the lagoon is home to tarpon and barracuda. Other fish that can be caught inside or outside the reef include: marlin, tuna, snapper, grouper, and dorado. 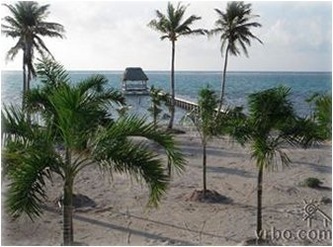 Indulge in the tropical experience at this prime Belizean getaway. With 5,000 square feet of property for you to enjoy, this 3-story house will perfectly and comfortably accommodate 10 people. 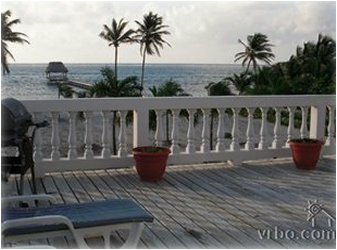 Located on the Caribbean on Ambergris Caye, this beachfront villa offers every amenity to make your vacation one that will keep you coming back again and again. 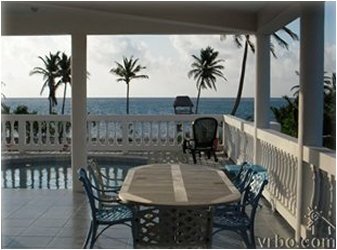 Villa Aurora boasts two spacious balconies, where you will enjoy a breathtaking view of the clear blue waters of the Caribbean and egdes of the Great Barrier Reef. 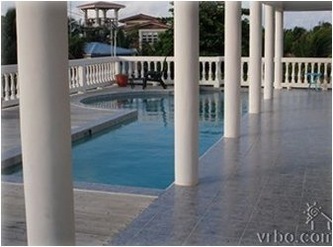 The second floor patio has a large pool, and provides ample room for relaxing in a chair, or holding a BBQ. The third floor covered veranda has plenty of space as well, where you can enjoy amazing island breezes, and from the roof, incredible sunsets as well as views of the sea and lagoons can be enjoyed.